Pringle Tube - or other circular crisp box. 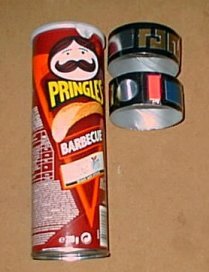 Small - Medium hands - use a Pringles box - or similar circular crisp box. 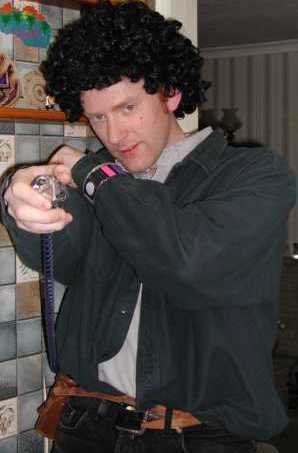 Large hands - Use an adhesive tape tube. Designs of the bracelets seem to vary throughout the episodes, but my version is taken from the Episode, Cygnus Alpha. Take circular crisp box and using a craft knife carefully slice into sections of equal width (approx 1.5 inches). Measure a strip of black card to curl around your cardboard tube and cut out to size. Take coloured card. Cut out shapes in the relevant colours as shown in diagram above. Lay out black strip and glue cut out shapes in the order as shown above. Take sticky back plastic and cut out a section about half an inch wider than your black strip. Place this over coloured shapes and smooth down to remove any air bubbles. Fold strip around your cardboard tube and tuck excess plastic under the rim of the tube. Press down firmly to attach plastic and use extra selotape where necessary to secure strip onto the tube. Trim away any sharp edges on tube. Place onto wrist and TELEPORT NOW!